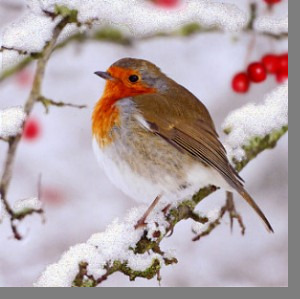 Charming photograph Christmas card with a cheeky robin as the star of the show. Our feathered friend is perched on a branch and has plumped himself up to keep warm in the snow. Glitter detail has been added to the snow to really make it sparkle and stand out. The photograph was taken by Roy Glen, a wildlife photographer who specialises in photographing wild birds in their natural habitats.